IUJ’s 2018 Graduation Ceremony was held on Saturday the 23rd of June at the Koidego Cultural Hall. The picturesque Hibiki no Mori Park surrounding the venue provided the perfect backdrop for students to take pictures with friends and family before the event commenced. 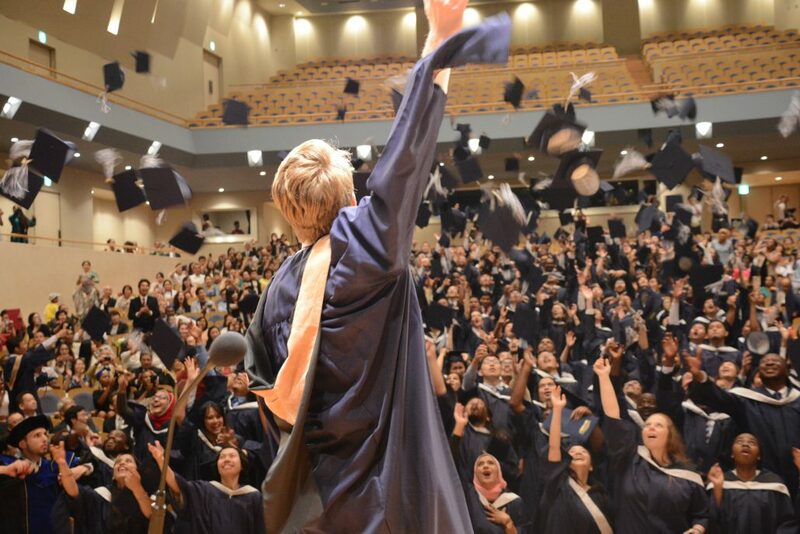 Guests took their seats inside the hall, and gave out rapturous applause as the graduating classes entered. The first address to the audience was from IUJ President Dr. Hiroyuki Itami, who spoke about what makes the university such a special place. He mentioned that not only is IUJ truly a spot where the world gathers, but a place with beautiful natural surroundings where students can draw energy from. Dr. Itami also quoted a famous line from Steve Jobs, the former CEO and co-founder of Apple. Jobs had spoken to students at a Stanford University Graduation Ceremony back in 2005, and told them to “Stay Hungry, Stay Foolish”. Itami noted that you need hunger to overcome obstacles that will come in the future, and some foolishness to make decisions that others may not – such as coming all the way out to IUJ. Often, the decisions that may seem foolish are the ones that change your life for the better. Click here for the full text of President Hiroyuki Itami’s speech. The audience was then addressed by Masaaki Shirakawa, the 30th Governor of the Bank of Japan and professor at Tokyo’s Aoyama Gakuin University. He spoke about his professional career as the Governor of the Bank of Japan during some tough financial times, particularly the Global Economic Crisis of 2008. Making decisions with integrity was a key to Japan weathering the economic storm of that period, and he emphasised the importance of this to students when it comes to making decisions in their own professional careers. Click here for the full text of Mr. Masaaki Shirakawa. After the deans of the school spoke to the audience about education matters at IUJ, it was time for degree certificates to be handed out. At this year’s graduation ceremony, the university’s very first PhD was awarded to Nicholas Chapman from the United Kingdom. IUJ’s PhD program commenced in September of 2015, and has been growing in size each year. Alongside IUJ’s first awarded PhD, there were 98 students graduating with their Master’s from the Graduate School of International Relations, and 88 students graduating with their Master’s from the Graduate School of International Management. 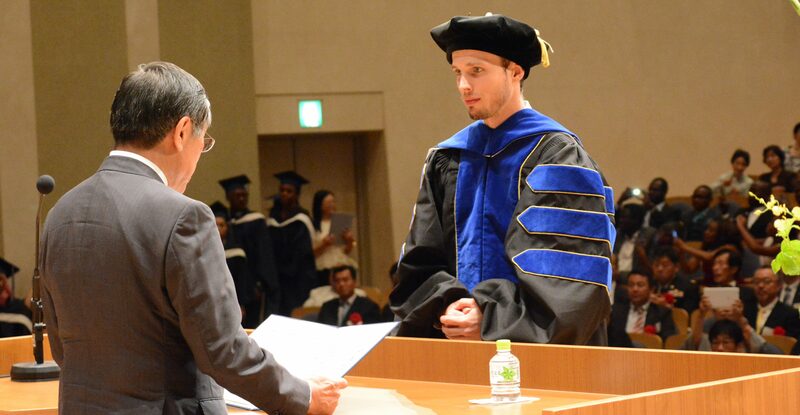 Many students had loved ones who traveled from around the globe to celebrate with them here in Japan, and their pride was evident during the awarding of degrees – there were several different countries flags being waved with plenty of excited cheers and applause. Once all the certificates had been awarded, several students took to the stage to speak to the crowd. The Master’s valedictorian for the Graduate School of International Relations, Buyisile Nzima, spoke about how after her years at IUJ she’s not saying goodbye to colleagues, peers, or friends, but people that feel like family. She also mentioned a Zulu quote, “umuntu ngumuntu ngabantu”, which in English roughly translates to “I am who I am because of you”. Ms. Nzima stated that everyone in the hall contributed to making the students who they are today, and the nature of IUJ challenges students in wonderful ways – both academically, spiritually, and emotionally. Click here for the full text of Buyisile Nzima’s speech. 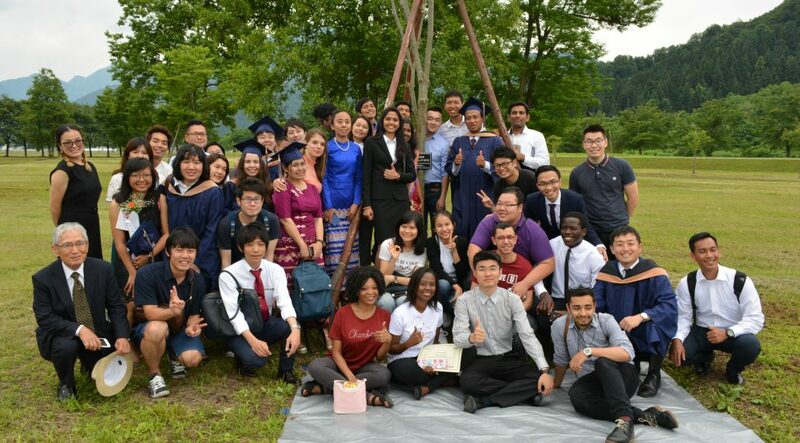 Aleksandra Khvan, the 2018 Graduate School of International Management valedictorian, spoke about the brave move that students took by heading to Minamiuonuma – a place that is far from home for so many. However, she mentioned how quickly bonds were made, which saw strangers almost instantly becoming friends. IUJ is known for being a place where the world gathers, and Ms. Khvan noted that now is the time for students to take what they’ve gathered from studying at IUJ and share it with the world. Click here for the full text of Aleksandra Khvan’s speech. Lastly, the audience heard from PhD graduate Nicholas Chapman, who summed up the essence of what IUJ stands for. He said that it is through our differences that we learn the most – and those differences encourage engagement, dialogue, learning, and a sense of community spirit. IUJ has students hailing from all corners of the globe, representing different nationalities, races and creeds – and that is a key element in what makes IUJ so special. Click here for the full text of Nicholas champman’s speech. At the conclusion of the ceremony, students made their way back to the IUJ Campus for the unveiling of their class trees in the school’s Alumni Forest. Each year, two new trees are added to the campus grounds – one for the graduating class of International Relations, and one for the graduating class of International Management. The goal is that the trees, like our graduates, will grow strong and thrive in their new environment. We wish the IUJ class of 2018 the best for their future – both personally and professionally – and we thank them for their contributions to making the university a unique and enriching place to learn.